The Norwegian government has promised to help the country’s huge salmon industry find new buyers for its fish, in the wake of a Russian boycott. At the same time, the industry may find ways of getting its fish to Russian buyers after all, through the proverbial back door. Some call it “the China method,” which has involved selling Norwegian salmon to other Asian buyers who in turn sell it to China. Newspaper Dagens Næringsliv (DN) reported as early as last week, just days after the Russian boycott took effect, that creative salmon sellers were already looking for similar means of sidestepping the Russian blockade. The “China method” emerged after China blamed the Norwegian government for its embarrassment over dissident Liu Xiaobo winning the Nobel Peace Prize in 2010. Norwegian salmon suddenly began being held up at the border to China, and fell from making up 90 percent of China’s market to just 30 percent. Almost overnight, however, sales of Norwegian salmon to China’s neighboring Vietnam skyrocketed. “History has shown that salmon always finds its way to market,” one unidentified industry player told DN. Now salmon that had been earmarked for Russian buyers may first be sold to an eastern European country with which Russia is still doing business. That’s happened during earlier conflicts but may be more difficult now, since so many of the eastern European countries have joined the EU, not least Poland. They are thus also affected by the sanctions and boycott that have arisen because of Russia’s military intervention in Ukraine. Norwegian government officials, meanwhile, have promised financing guarantees for seafood exports to Ukraine itself. Sales to countries like Ukraine and Kazakhstan may offset lost sales to Russia, noted newspaper Finansavisen this week, while salmon might also be funneled through Iceland or the Færoe Islands, which are not members of the European Union and thus not subject to Russia’s boycott. Large premium Norwegian salmon producers Salmar and Frøya of Sør-Trøndelag had been exporting up to 10 percent of their fish to Russia, reported DN, generating revenues of around a half-billion Norwegian kroner a year. 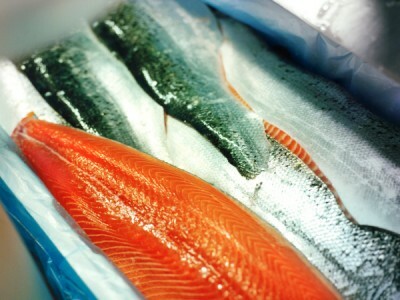 Norway Royal Salmon also has sold much of its production to Russia, which along with France have been Norway’s largest individual national markets. DN reported that Norway Royal Salmon has sent fresh salmon to Russia from its processing facilities at Espevær in Bømlo, Rypefjord in Hammerfest and Bø in Nordland. The biggest Norwegian salmon producers, Marine Harvest and Cermaq, meanwhile, also have major operations in Chile, which could send fish to Russia. Others aren’t so sure, however, whether the Norwegians will succeed at unlocking a back door to Russia.